Probashbangla24 online Desk : Prime Minister Sheikh Hasina attended a meeting with Saudi King Salman bin Abdulaziz Al Saud at his royal palace in Saudi Arabia’s capital Riyadh on Wednesday. The Bangladesh premier met with Salman, also the custodian of the two holy Mosques, at 1:30pm local time. The two world leaders had lunch together after the meeting. Foreign Minister AH Mahmood Ali, PM’s Private Development Affairs Adviser Salman F Rahman, Foreign Secretary Md Shahidul Haque, Bangladesh Ambassador to Saudi Arabia Golam Moshi and PMO Secretary Sajjadul Hassan were, among others, present at the meeting. 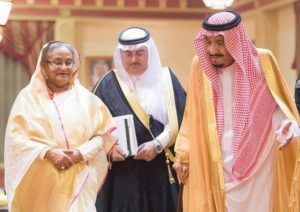 PM Sheikh Hasina reached Riyadh on Tuesday afternoon on a four-day bilateral visit to Saudi Arabia at the invitation of King Salman bin Abdulaziz Al Saud.